You are not logged in. Login here. This is a partial preview of the document. Login to FlevyPro for the full preview. If you are logged in, your referral link [?] is automatically included below. Digital technologies have transformed the way we interact and work. An open culture and candid communication between the employees and executive management builds mutual rapport and trust, which is essential for timely and effective decision making in these changing times. Organizations have already started embracing flat and lean organizational structures with decentralized decision-making authorities across the board, or at specific departments. Companies are experimenting with unique operating structures devoid of any defined hierarchy, strategy, management, or titles; and have witnessed better results. These "digital native" structures are not likely to be implemented everywhere but should not be ignored by the leadership. These digital organizational models provide a foundation for the leadership to develop their own structure to achieve digital maturity. The slide deck also includes some slide templates for you to use in your own business presentations. Got a question about the product? Email us at [email protected]. If you cannot view the preview above this document description, go here to view the large preview instead. FlevyPro is a subscription service for on-demand business frameworks and analysis tools. FlevyPro subscribers receive access to an exclusive library of curated business documents—business framework primers, presentation templates, Lean Six Sigma tools, and more—among other exclusive benefits. Click here to learn more about FlevyPro and its benefits. This is a FlevyPro document. FlevyPro is our subscription service for on-demand business frameworks and analysis tools. FlevyPro subscribers receive access to an exclusive library of curated business documents—business framework primers, presentation templates, Lean Six Sigma tools, and more—among other exclusive benefits (click here to learn more). This document is one of the documents in this curated library. We add new documents to our library on a continuous basis, based on member requests. As a FlevyPro subscriber, each month, you receive a set number of available download credits. You do not need to pay for any documents from the FlevyPro document library, unless you exceed your download credits. This means, if you subscribe to FlevyPro now, you can download this document on this page without spending extra. Click here to learn more about the FlevyPro subscription plans. Did you know? For $9.00 more, you can download this document PLUS 4 more FlevyPro documents. That's only $5.80 per document. Click here for details. Purchase includes lifetime product updates. After your purchase, you will receive an email to download this document. What's the value of Strategy without proper Execution? This 54-slide presentation introduces 12 powerful frameworks spanning both Strategy Development and Execution. To receive this free download, enter your email address below and click the "Email Me" button. FlevyPro is our subscription service for consulting frameworks and business templates. It is a must-have for any independent consultant or boutique firm. We arm them with the same—if not greater—access to a library of consulting frameworks that global consulting firms have at their disposal. Learn more about our value proposition to consultants here. View more from: ARC Strategy Ltd.
What's the value of Strategy without proper Execution? 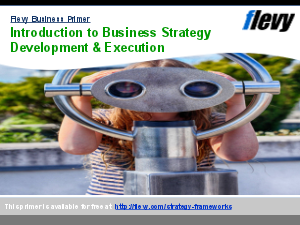 This 54-slide presentation introduces 12 powerful frameworks spanning both Strategy Development and Execution.